Making the world a better place can be tough. But as these tenaciously altruistic moves prove, sometimes all you need is a great idea. In 1990, a teacher in rural Colombia named Luis Soriano noticed two things: First, many of the local children were illiterate; second, he happened to own two donkeys. So he did the logical thing, and created a “biblioburro,” or a library donkey. At dawn, Soriano loads up the donkey’s saddlebags with more than 100 books. Then, he travels to remote villages where he picks up kids, gives them rides to school, and encourages them to read while they commute. This has been going on for two decades, despite the fact that Soriano has a full-time job and was once attacked by bandits on his route. (When the robbers saw he had no money—only a donkey laden with books—they tied him to a tree and left.) 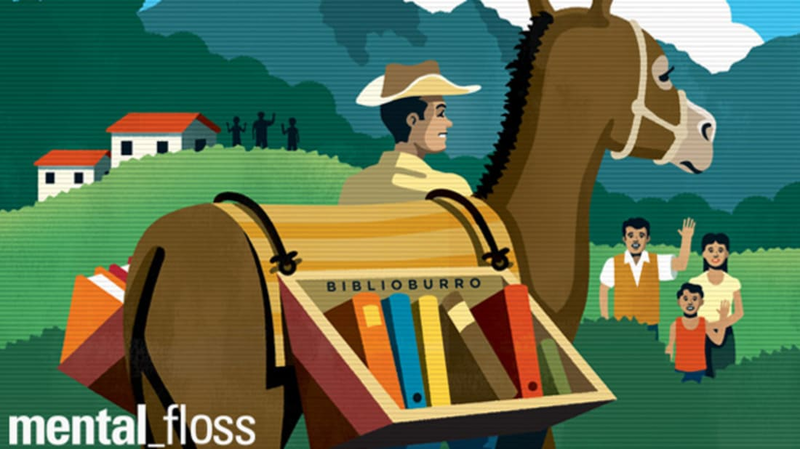 Since the project began, the biblioburro has served 15 villages and more than 4,000 kids. It started as something of a joke. In 1785, a French mathematician named Charles-Joseph Mathon de la Cour wrote a satire of Benjamin Franklin’s (famously optimistic) Poor Richard’s Almanack called Last Will and Testament of Fortunate Richard. This version involved a character so bullish about the future that, in his will, he bequeaths money that can’t be touched for 500 years. Franklin said he was “particularly charmed” with the idea—so charmed that he actually ran with it. When he died in 1790, he left £2,000 (about $8,800) to the cities of Boston and Philadelphia on one condition: They couldn’t touch the bulk of it for 100 years, at which point they could make a partial withdrawal. Then they had to wait another 100 years before getting the rest. The cities obeyed. Fast-forward 200 years, and the Franklin Fund is worth $6.5 million. In the mountains of Afghanistan, two giant statues of Buddha—the largest in the world—survived for 1,500 years. Then, in 2001, the Taliban blew them up with dynamite. It was part of the regime’s out-lawing and destruction of artwork they considered “idolatrous,” which included all music, films, and paintings depicting living creatures. Realizing that museums would likely be targeted next, Dr. Muhammad Yousef Asefi, an artist and physician, came up with a plan, and he struck back. Knowing that he risked imprisonment and likely worse, he quietly took more than 100 oil paintings (including his own work) from museums in Kabul. Using watercolors, he defaced the paintings, covering the figures with bright flowers and other inanimate objects. Seeing that their work had been done for them, the Taliban left the paintings alone. After the regime fell, Asefi used a sponge and water to restore the work back to its original condition. Today those paintings are back in their respective museums. Oakland, California–based sculptor Gregory Kloehn has always spent his mornings digging through mounds of illegally dumped trash, scavenging for materials. But ever since a homeless couple came to his house and asked for a spare tarp, he’s trained his focus on pallets, refrigerators, bed posts, washing machine doors, and slabs of plywood. With the scraps, which never cost more than $100, he cobbles together beautiful, whimsical homes, each about the size of a minivan. But the sky blue and cotton-candy pink shelters aren’t just pretty—they’re functional. He adds wheels to make them mobile, then donates them to the city’s homeless. In 1960, a field worker named Dashrath Manjhi was living in the hills of Bihar, India. A small mountain stood between his village and the nearest town, which meant that it took a roundabout 43-mile-long trip to reach the nearest hospital. When his wife fell and injured herself trekking through the hills, Manjhi decided enough was enough: He sold his three goats and bought a hammer, a chisel, and a crowbar. Then he started digging. By day, he plowed the fields; by night, he chipped away at the mountain. His neighbors said he was crazy. No one helped. He worked for days, which grew into weeks, and then months. He didn’t stop until he’d carved a corridor 30 feet wide and 25 feet high. Now the villagers have a direct path to the hospital—and it only took 22 years. For one night in December, children find joy and wonder in the unlikeliest of places: JFK airport. In 2010, about 100 kids from the Garden of Dreams Foundation—which has multiple causes ranging from leukemia to poverty—were put on a plane by Delta employees and told by the pilot that they were going to the North Pole. As the kids shut their windows and sang songs, the plane taxied to a nearby hangar filled with fake snow, elves, polar bears, Santa Claus, Knicks City Dancers, and famous athletes. The kids were overjoyed, and word has spread: The program has been reprised every year, and now the North Pole can also be found (seasonally) at airports from Detroit to LAX. The radio was a chilling instrument of the 1994 Rwanda genocide—the Hutu majority used it to encourage listeners to kill their Tutsi neighbors. As a result, private radio was banned for a decade afterward. Then, in 2004, the soap opera Musekeweya, or “New Dawn,” reclaimed the radio to inspire peace. Every Wednesday, an estimated 80 percent of Rwandans listen to a binge-worthy drama featuring two fictional villages, Bumanzi and Muhumuro, where two young lovers—à la Romeo and Juliet—try to unite the towns and prevent violence. The plot is carefully constructed in collaboration with psychologists and Rwanda’s Ministry of Justice, designed to stress a message of empathy, healing, and hope. It’s been more than a decade, and the story is still going strong. John D. Rockefeller Jr., the son of America’s first billionaire, thought long and hard about how to put his fortune to the public good. In 1914, he visited a private collection of medieval antiques, the “cloister museum,” which the owner called a “poem to Americans who never can or will see Europe.” Rockefeller was intrigued by the stash—chunks of old Gothic monasteries, Romanesque arches—and so was the Metropolitan Museum of Art. Rockefeller gave $10 million so the Met could buy the collection, move it to a sprawling location in northern Manhattan, and build a garden-speckled space that had a breathtaking view of the Hudson River and the cliffs of the Palisades, located just across the water. But it didn’t stop there. Given his father’s role in economic growth and industrialization, Rockefeller knew better than anyone that, eventually, new buildings on the Palisades would blot the perfect view. So he bought up that land and gave it to the Met, too. The U.S. conducted more than 5 million air raids during the war with Vietnam. Those jets used external fuel tanks, which allowed them to refuel mid-flight. The tanks were heavy and cumbersome, so when they were empty, the pilots simply dropped them to the ground. They still mar the landscape, a painful reminder of a terrible time. But recently, Vietnamese farmers started giving the fuel tanks a more constructive second life. The hollow tanks, when split in two, are canoe-shaped. They also float. And they’re sturdier than the farmers’ old wooden boats, long relied upon for carrying goods from village to village. Other people have used artillery shells, broken wings, even non-detonated bombs to make pots, pans, and farming spades. While war is never a pretty story, these tales of resilience and innovation are remarkable. Don McClure isn’t a tennis player. He’s a former auto mechanic who runs a jewelry business in Baker City, Oregon. In 2007, however, he bought a house on a large property with four grass tennis courts. He planned to scorch the courts—until he learned the whole neighborhood played on them. “When 70- and 80-year-olds had tears in their eyes saying how much they loved playing on those courts, my heart softened,” he says. “I had to keep them open.” He did more than that, devoting 30 to 40 hours a week to mowing, grooming, watering, and improving the courts. He painted the clubhouse, bought a new fridge and freezer, and regularly hosts tennis tournaments, popularly known as WimbleDON. He says he’s never made a dime, and he never swings a racquet.